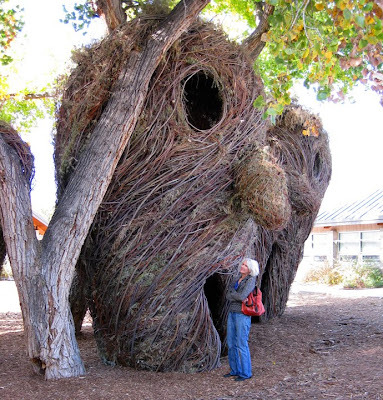 This morning was the perfect day to go to the Bosque School to see Patrick Dougherty's installation, which was done in conjunction with the Land/Art initiative that's going on this Fall. The weather was perfectly sunny, which popped the yellowing leaves of the cottonwood trees against the blue sky. We were meeting a friend who is always a little late, so we took time to stop at the Oxbow Overlook which is just down a neighboring street. The colors have changed so dramatically since I was last there in late August. The oxbow this morning, all the reeds have gone dormant, but the cottonwoods are turning their brilliant yellow. Back in August when everything down at river level was green and the mesa was as sandy and non-green as usual. 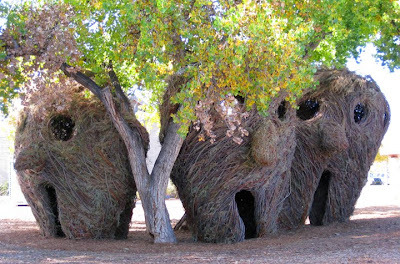 These pictures really don't do the Dougherty installation justice, because I can't capture the smell of the coyote willow (which is what he used to weave the structures), and because my camera just isn't good enough to deal with the contrasting light conditions of sun and shade. The photos from inside the structures came out particularly badly. However, I think you can get a sense of their scale and the playfulness of the big faces. Very cool. 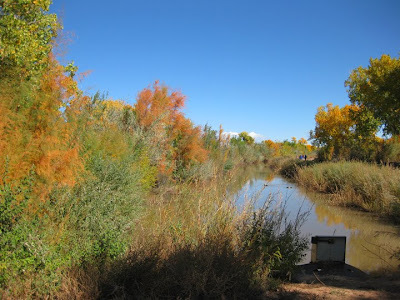 The fall color along the irrigation ditch was gorgeous too. 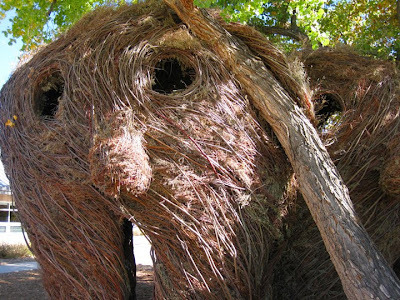 Wow, what a spectacular Dougherty installation! I saw one of his a few times in Iowa and I really loved it. I was also fortunate enough to get to see it in the fall and the winter and to see how the changing seasons affect the piece. But this one is spectacular with the faces! Thanks for leaving a nice comment on my post and I just wanted to pop over and congratulate you on signing up for NaNo after all! You're not behind at all, just the fact that you decided to take the plunge is awesome and you still wrote over a 1000 words! Looking forward to hearing the updates as the month progresses. S.
Thanks, I've never tried to write a novel before, so its a little nerve wracking! The faces are really cool. Very appropriate for a Mid/High School location right before Halloween too. The craftsmanship is really amazing too-- you can't really figure out his structure just from looking at it. My camera didn't capture the details well at all, but the weaving is really thick. There were times that viewing was open while he was there working on it, but I didn't make it to any of them. I wish I had because I'm curious now as to how fast it came together, whether he has assistants, etc.